Our roll on and off skips are available for commercial hire, and can be delivered across Norfolk. We have two sizes of roll on skip available, so choose from 20 or 40 yards. Our roll on skips are charged based on material weight within the skip upon collection, so we do not recommend using these for soil or rubble. Due to the specialist nature of our Roll-On skips, we are unable to currently offer booking for these online. Should you wish to make a booking, please call us today on 01603 721533. Our team will discuss your specific needs and arrange your skip accordingly. Alternatively you can use our contact form at the bottom of the page and we will get back to you as soon as possible. Please note: The following items must not be placed in your hire skip. Plasterboard must not be mixed in with general waste, either purchase a bag with your skip to segregate the plasterboard or see our plasterboard page for more options. If in doubt leave it out. Call us to check before booking, if you are unsure if your materials can be placed in your skip. This is our largest available skip. 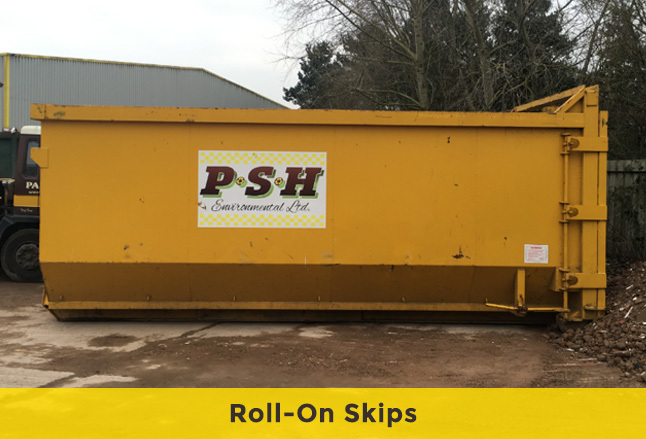 This large roll-on Roll-Off skip is ideal for industrial use. Often used for commercial clearance for lightweight but bulky and otherwise difficult to dispose of waste. We require a minimum of 40ft in length to be able to deliver your Roll-On, as space is required for the length of the lorry and the Roll-On itself. This style of skip is only available to commercial hirers. They cannot be delivered to domestic properties. Should you require a skip for a residential property, please view our standard skips for hire. If you require multiple skips for a construction site, our team can certainly arrange this. Call us today to discuss your requirements.